I love Nature's Path cereals. They are organic, are certified gluten free (selected varieties) and really tasty. 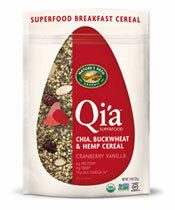 They have a new cereal line out called Qi'a (kee-ah) which is made with Chia, Hemp and Buckwheat. It comes in 3 varieties Cranberry Vanilla, Original, and Apple Cinnamon. This cereal is called a superfood and one serving is only 2 tablespoons. It says to leave the cereal in milk (or non dairy substitute) for 5 minutes for the chia seeds to soak. I used unsweetened almond milk, and it was fine. After five minutes I went to dig in and was a little surprised by the texture. Chia seeds expand like crazy in liquid and as a result, the cereal is more like a gel or pudding. Mind you it still tasted great, but I think it will take a little while to get used to the texture - or pretend it's a pudding as opposed to cereal! I think it would be good sprinkled on yougart or with another cereal such as corn flakes. The Qi'a line is gluten free, organic and of course non-gmo. It also has no added sugar, and the sugar per serving on the Cranberry is 3 grams. There is also 4 grams of fibre per serving - so a little goes a long way! Costco now carries the 650 gram bag for $15.49 :)! The grocery store one is 225g - so this is a little cheaper.